I finally did it. I walked into Mordor, and I have the title to prove it. They said one simply could not do it, yet here I am. You ask, “but last time you posted about Lord of the Rings Online, weren’t you were in Moria on a rune-keeper?” Yes I was. And I finished Moria, too, by the way, and I still love my rune-keeper and I have been working my way through southern Mirkwood with him lately. “Then what are you doing in Mordor with your old captain that you haven’t played in a couple of years?” Excellent question, hypothetical reader with a surprising knowledge of my many alts! The answer is that I finally broke down and bought the Moria collector’s edition and boosted my cappy to 105. I’m not gonna lie, it was a bit of a rough week/month for me, and this was kind of a stress buy. Plus it was on sale, and apparently I can’t resist a sale. I was recently playing with my friend on his captain, and it reminded me of how much fun I used to have with that class. Unfortunately, my captain was also half way through Moria, so redoing the content I just did on my rune-keeper didn’t sound very appealing. A level boost seemed like the perfect remedy for this situation, and one just happened to be included with the collector’s edition of Mordor. And honestly, at the rate I plod through content in this game, I’m starting to worry that I’ll never see a lot of the later content before the game shuts down (not that I’m expecting that any time really soon, but realistically, it’s not going to be around forever). Several things jump out at me upon boosting from Moria/Siege of Mirkwood content straight to content that’s less than a year old. First is just how much better this game’s graphics have gotten. The graphics in Eriador show their age, though there are certain places where it really doesn’t matter; the landscapes are absolutely gorgeous despite 2007’s technical limitations. The graphics in Mordor are significantly improved, with some really nice texture and animation work. 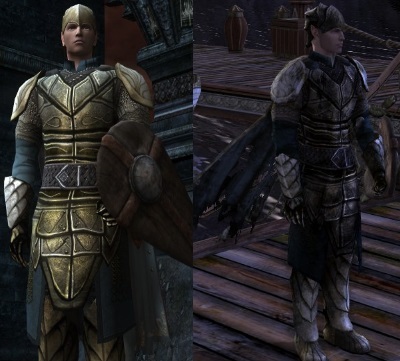 Yes, to a certain extent, it still looks like a game from 2007–most NPCs’ textures still look painted on, with no facial animation or overly fancy armor meshes, and of course some of those same awkward animations are still there and just as awkward as they were back in the day–but still, the improvement is striking, especially not having progressed slowly and naturally through the areas added by the various expansions. Second is that, while I thought ahead enough to boost a character who had all of their skills unlocked and whose rotation I was familiar with, I have no idea how to do mounted combat and the Aria gives you zero mount XP. So far it has only been a problem here and there, so hopefully it won’t be of a big deal, but still, it would have been nice if they had boosted my mount’s level as well as my character’s. I am also once again reminded of what a great job this game has done with its worldbuilding. Granted, as much of it as is reasonably possible is pulled straight from the pages of Tolkien’s books, but I think that master wordsmith would be proud of what Turbine/Standing Stone has added to his legendarium. And the attention to detail never ceases to amaze me! Frodo is even missing a finger in the scenes after the ring is destroyed! I had to fiddle around with my camera for a few minutes to even check. 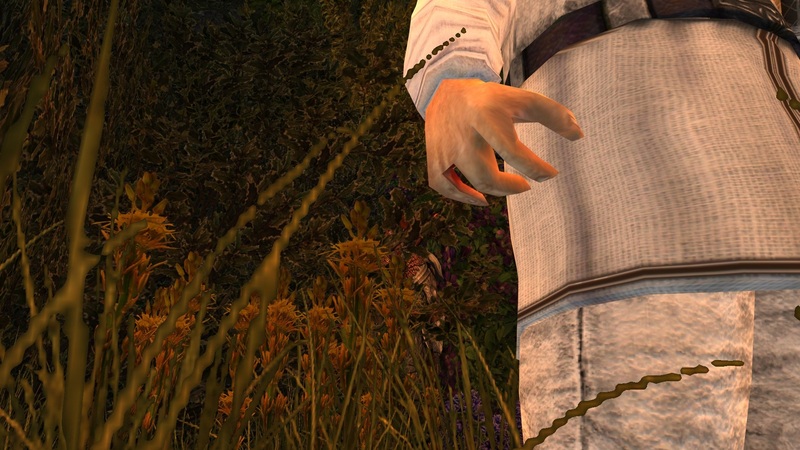 A lesser studio wouldn’t have bothered to create a new nine-fingered character model, or at best just slapped a bandage texture over his ring finger. That’s dedication! The Mordor collector’s edition also came with the High Elf race and a character slot. While I’m trying to resist the temptation to create yet another alt, I figured I’d at least run through the unique tutorial instance they created to shoehorn in this minutely different, anachronistic set of elves. It was cool to get to be a part of The Last Alliance and see the Free Peoples’ first encounter with the Nazgul, though I was kind of disappointed I didn’t actually get to be there for the defeat of Sauron. Rather, I got stabbed with a Morgul blade à la Frodo, which apparently, rather than turn them into a wraith as the Witch-King thought, causes High Elves sleep for three thousand years. I also thought it was cool that they start you out with a set of armor that looks like the one you wore in the tutorial, but old, tarnished, and complete with a tattered cape. Not only is it sometimes nice to have gear that isn’t in totally pristine condition, it also makes sense for something that’s been taking up space in Elrond’s Attic for a few millennia. All told, I’m really happy with my purchase, and really happy to be back in LotRO.